Connecting your Facebook page with your website’s live chat opens up a world of possibilities. For both your live chat and social media marketing. 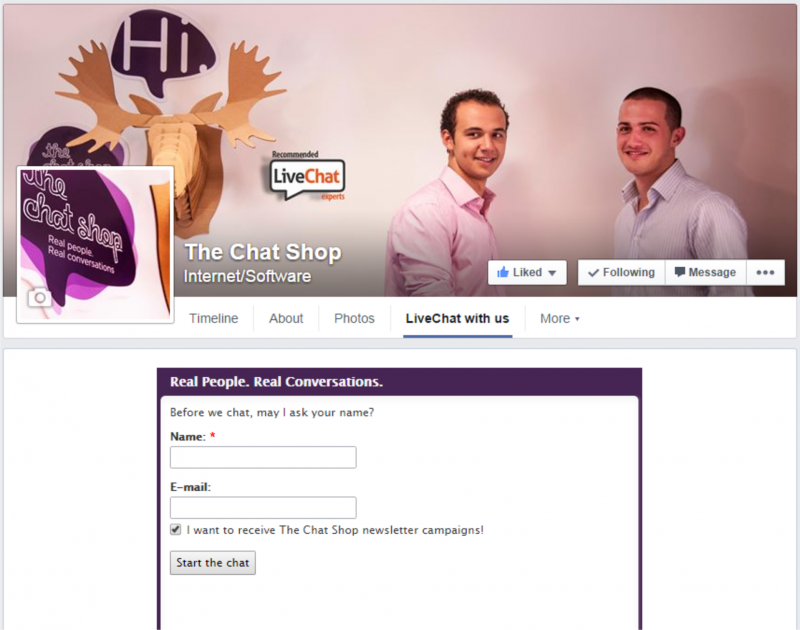 Live chat with Facebook is just one of the many integrations which we use here at The Chat Shop. Here’s how you can use a Facebook integration to get more chats and more engagement on your Facebook page. Pairing your Facebook with your website’s live chat means that you can have a ‘like’ button for your page as part of your chat window design. 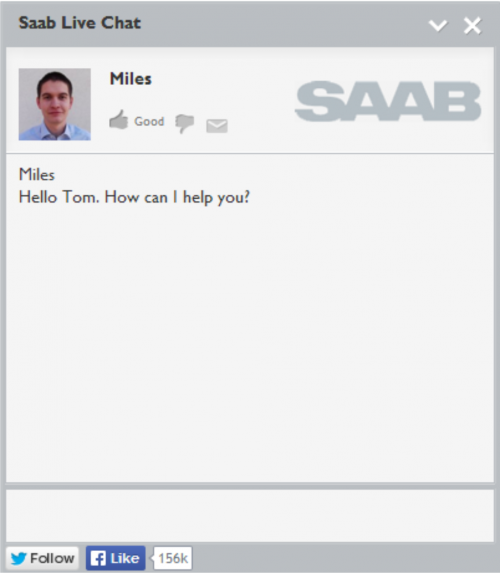 Just like we’ve done at the bottom of the Saab Parts UK chat window (image on the right). After a site visitor has come on to live chat and had a positive experience with your live chat agents, they will be encouraged to start following your updates across social media. Along with being encouraged to convert or enter their details for lead capture. It’s a great opportunity to grow your audience with potential new followers in every chat. The ‘Like’ button also takes nothing away from the user experience of those uninterested in your Facebook activities. With the ‘Like’ button being just a click away, it’s simple to have growth of your social media presence as part of your live chat strategy. Live chat agents don’t just have to be there to solve customer issues or recommend the best product to buy. When customers have had a positive experience on chat, live chat agents can encourage visitors to give your page a ‘Like’ in order to keep up to date with the latest company news and/or product releases. If you also offer customer support via social channels, this is the perfect opportunity to advertise the diverse communication channels your customers have. Whether a particular customer expresses an interest in communicating through social media instead of your website or not, your agents can advise that “customer service is available across multiple channels” during chats. If you are trying to make your customer service more accessible to your customers, let them know it. Interested in offering customer service through social media, as well as your website? There’s no need to invest extra resources in order to offer this extra customer service channel. You can live chat straight from your Facebook page – with the same agents. The image on the left is our live chat window on our Facebook page. Live chat can be made accessible as an app on your page for your customers – meaning that you can provide support to customers which don’t want to stray from Facebook. If you’re using click to chat to increase conversions this also means the opportunity to get more engagement with your chat. You can recommend even more products and make more sales by opening up to even more potential chatting traffic. If you’re interested in grabbing a few details from customers before they enter a chat (so that you can start calling them by their name straight away or so that you have a follow up contact method) you can start using a Facebook log in to do this. If a customer wants to start chatting quickly and doesn’t want to waste time entering their details, they can use their Facebook log in to quickly start the chat. Live chat with Facebook integration allows users that are already logged in to Facebook to have the option of transferring their details across to get the help they need even quicker.